Are you looking for a dream job? Why not consider a career teaching recreational PADI scuba diving courses? 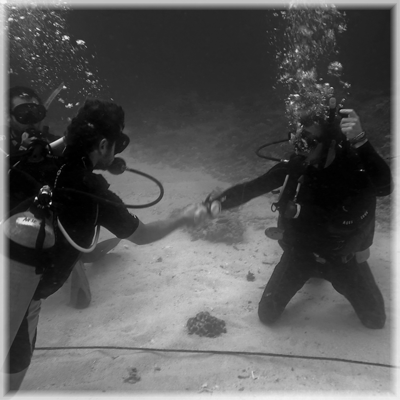 As a PADI Instructor you will get the chance to train, guide and develop divers. At Trawangan Dive this dream can become a reality. We run instructor courses every month training people to go out into the industry and literally “live the dream”, teaching their own PADI programs and developing the next generation of divers. The prerequisite for the Instructor Development Course is to have been a certified diver for over 6 months, be a certified PADI Divemaster with 100 logged dives and be over 18 years old. The course consists of classroom based knowledge development sessions where you learn all of the standards and procedures that apply to each individual PADI program and in water workshops where you will work with your fellow candidates developing you own individual teaching style. Additionally there will be theory sessions, risk management workshops and sales and marketing presentations. We also offer some additional IDC Gili Trawangan Workshops, which aim to introduce the new Revised Open Water Diver Course to our IDC candidates. Once a PADI Instructor candidates can expect to go into the industry with confidence and “teach the world to dive”, and literally “live the dream”. Instructors will be looking at positions in some of the most beautiful locations worldwide giving them a chance to earn whist travelling the world and of course introducing people to the underwater environment and a whole new world. If you’re looking for a new career in teaching recreational diving look no further. The PADI IDC Indonesia professional training programs can prepare people for career in professional diving. To see current and past students in action check out our PADI IDC Indonesia Facebook Page or the IDC Gili Trawangan Video.